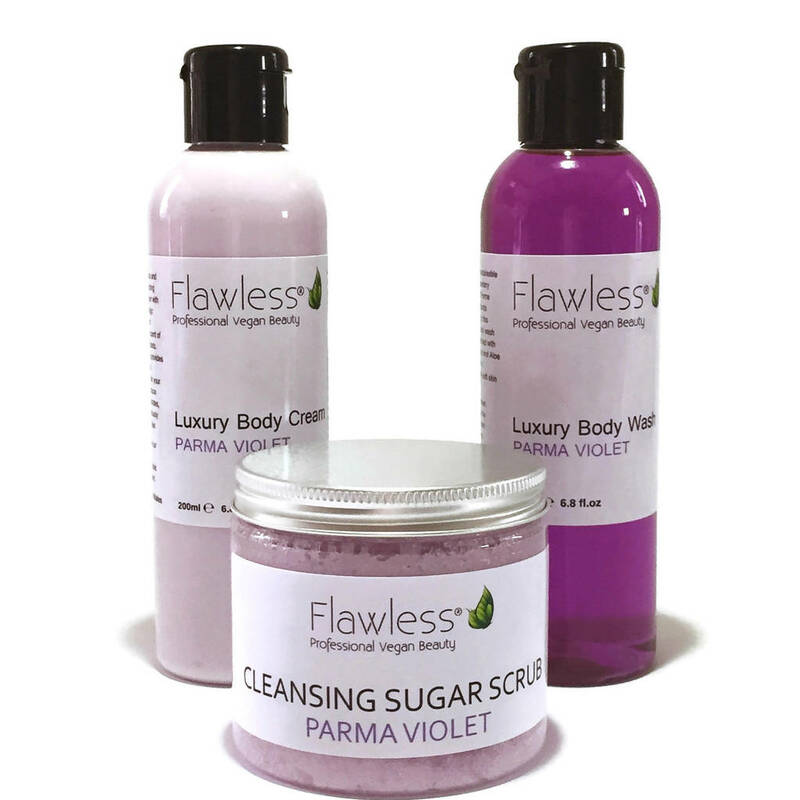 Our Parma Violet vegan bath and body gift set contains Luxury body Wash. 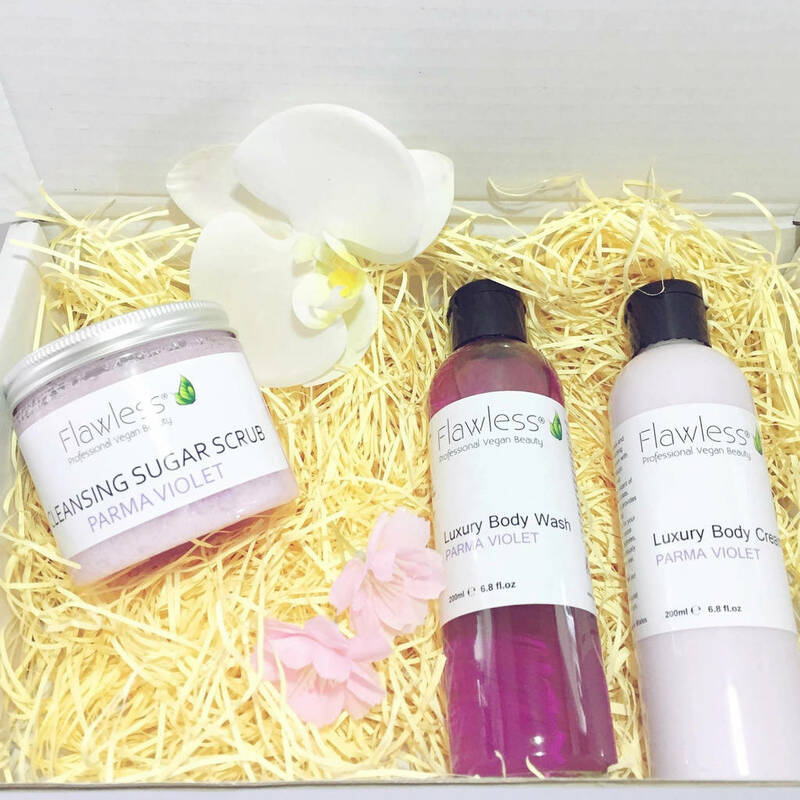 Luxury Body Cream and a Cleansing Sugar Scrub. Luxury Body Wash 200ml - This body wash works up a fantastic creamy lather and feels wonderfully soft on your skin due to the addition of Panthenol. We have also added aloe vera to soothe the skin. Luxury Body Cream 200ml - A luxurious and fast absorbing body cream enriched with Argan oil which provides wonderful nutrition for your skin. Cocoa butter further hydrates, for a gloriously soft skin feel. Cleansing Body Scrub 200ml - Reveal a smoother more radiant you with this exfoliating sugar scrub. Our gentle cleansing formula is infused with the sweet scent of violets and enriched with panthenol for softness. Your skin will thank you for the indulgence. You can make this set extra special by having the label on the front of the box personalised at no extra cost. Simply send me a message of the name you would like to printed on the label on the front of the box. This gift set ontains 3 luxury vegan skincare products.